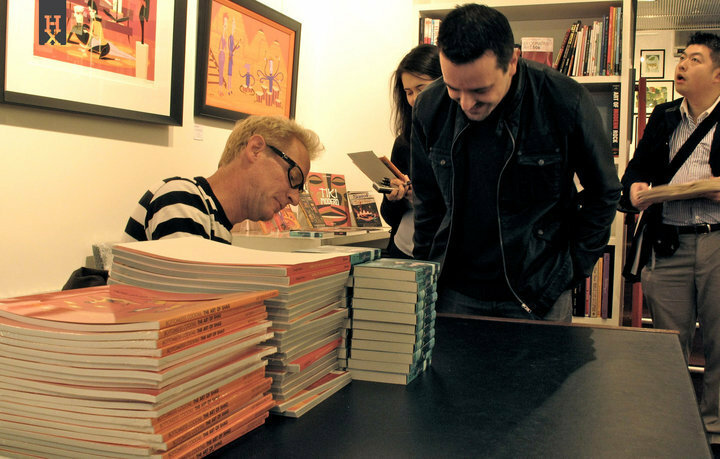 Perth from 28th August to the 17th September 2010 with a book signing on the 28th August. 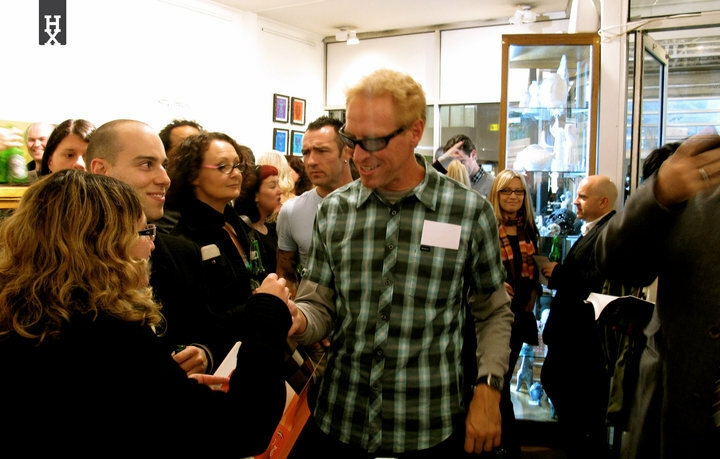 This was the first major exhibition at Outré Galleries Perth site. 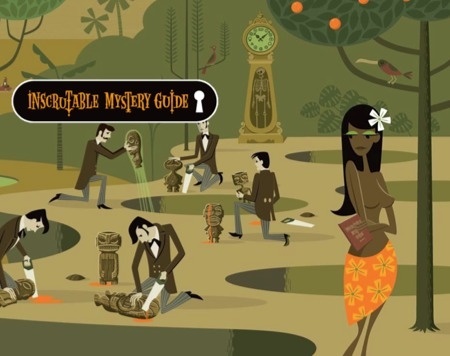 The Inscrutable Mystery Guide is Shags return to form after his darker introspection over the previous year. 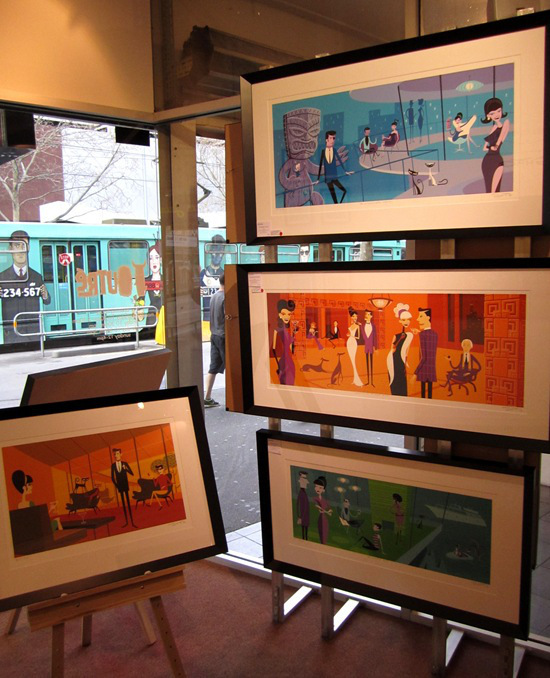 Josh Agle said of the exhibition “In the past year my work has gotten darker and moved into new themes and imagery, but I’m trying to reconcile my old body of work with my new work, and trying not to be as manic depressive and serious as I was in the last year or so“. 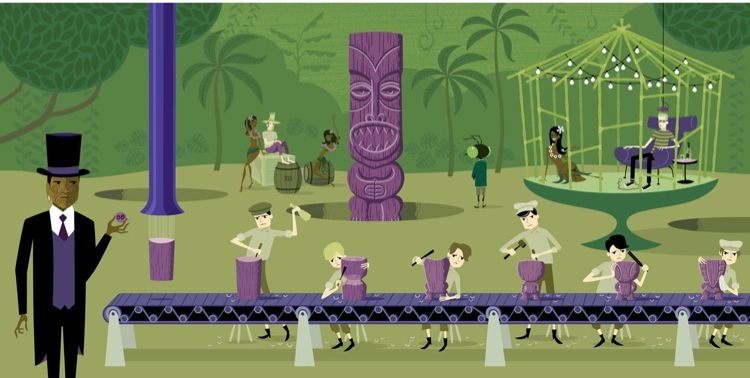 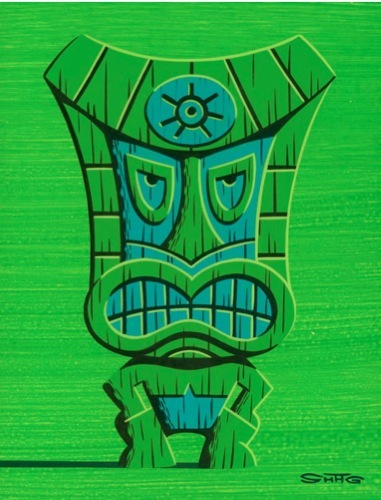 In addition to the five super-sized panoramic digital prints were ninety-nine small colorful Tiki paintings. 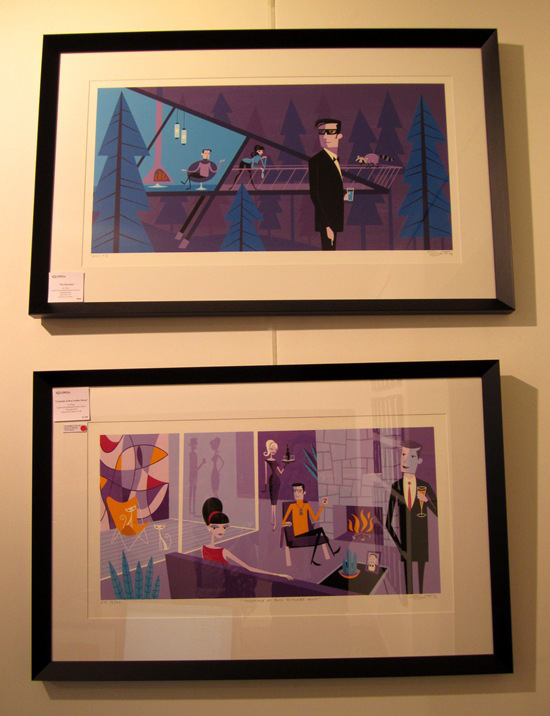 Also, several serigraph prints were shown including artist proofs. 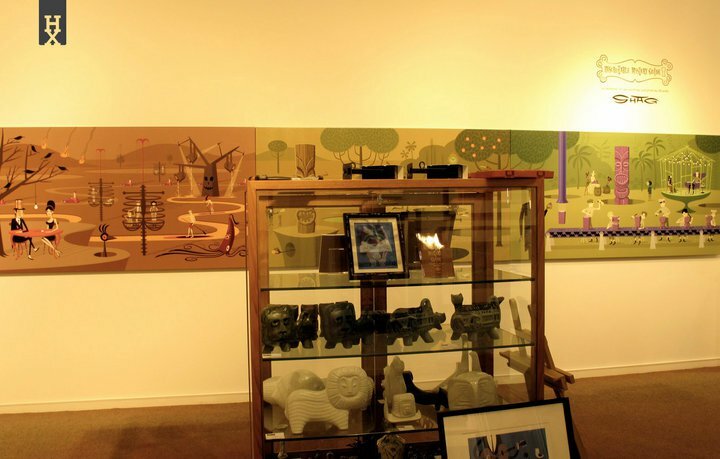 The five panoramas are each sized 72” long by 36” high with the images digitally printed on canvas in very limited editions of five. 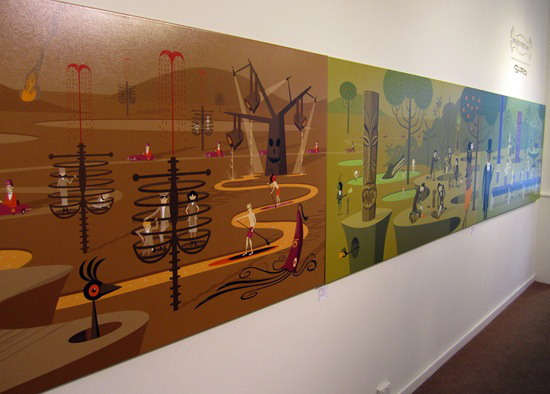 The huge landscapes tell a story if you can decipher the composition; three of the panels (Black Eyes, Blood Oranges, and Efficiency Expert) were shown as a tryptic to give clues to the exhibition theme. 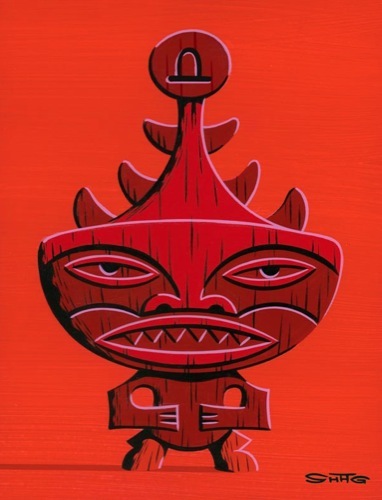 In an interview, Shag discussed the theme alluding to the time when Europeans colonized the South Pacific, destroying traditions and introducing Christianity. 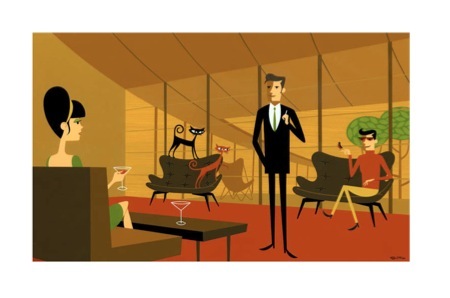 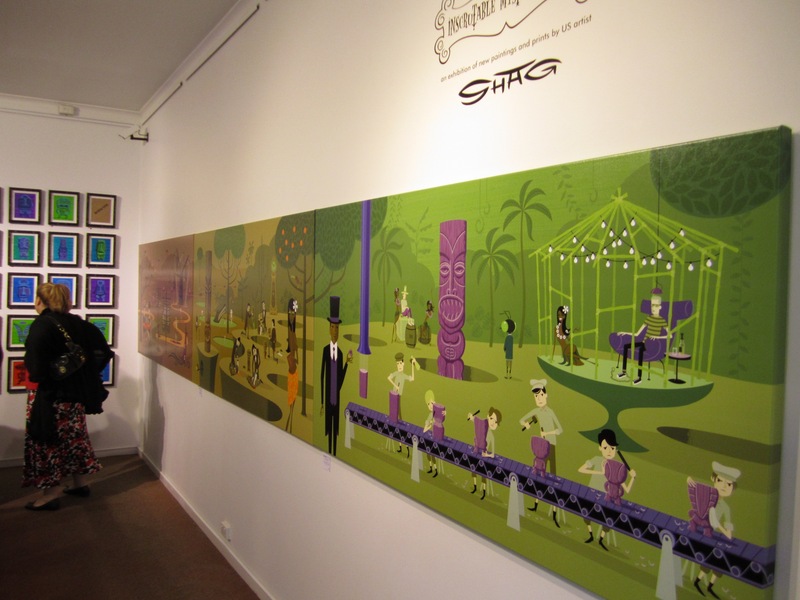 Shag has painted a self-portrait into each of the images as well as a boy with an ant head. 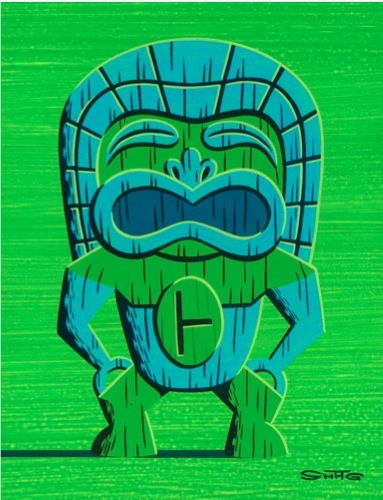 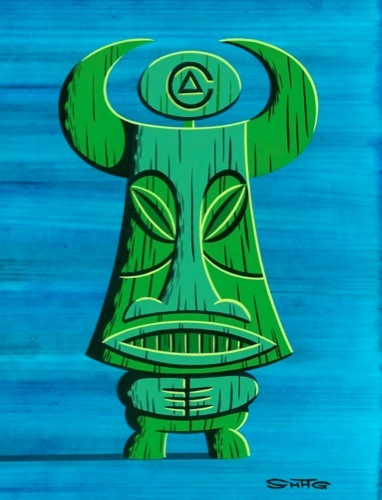 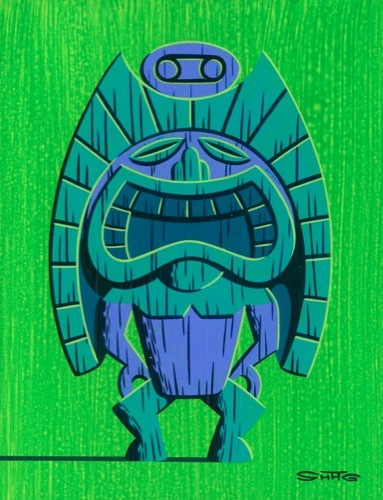 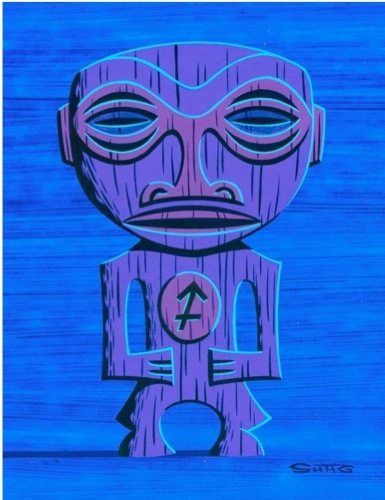 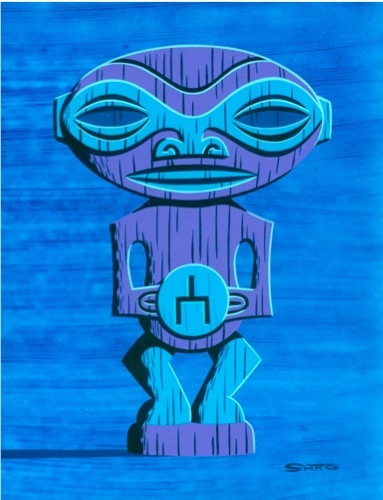 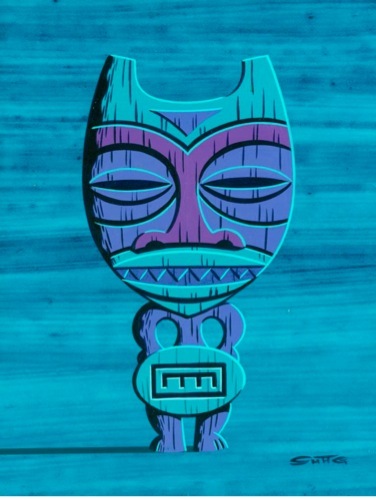 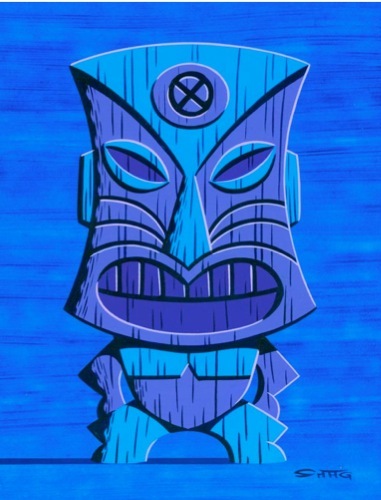 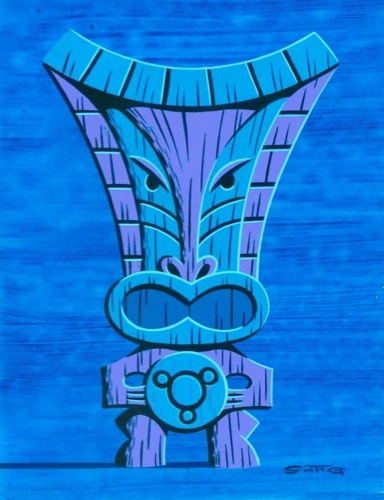 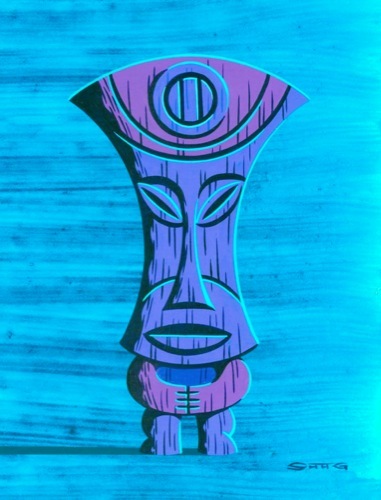 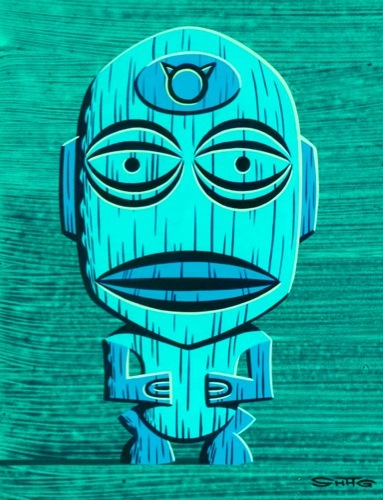 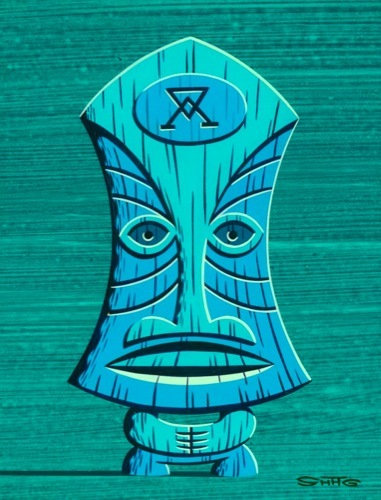 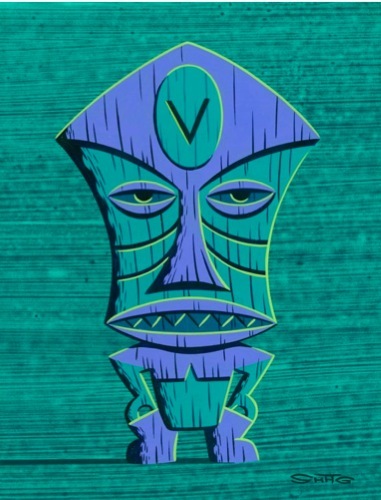 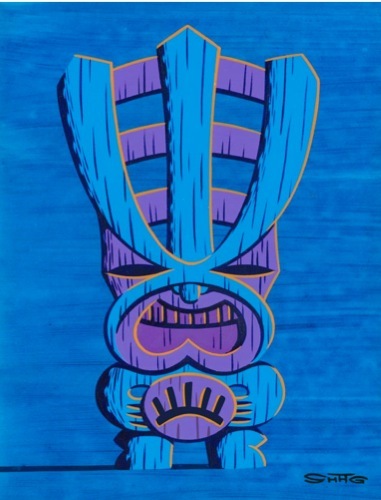 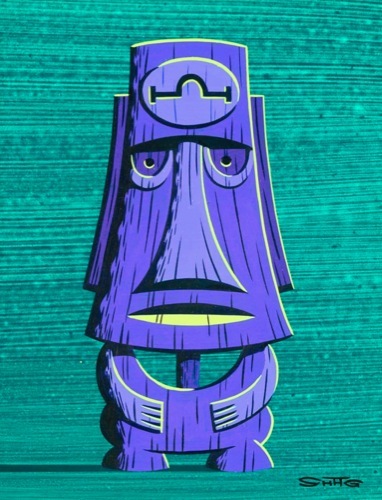 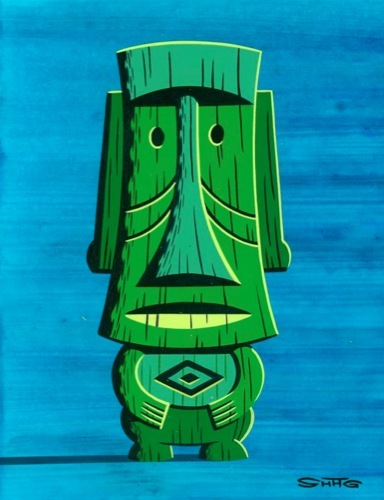 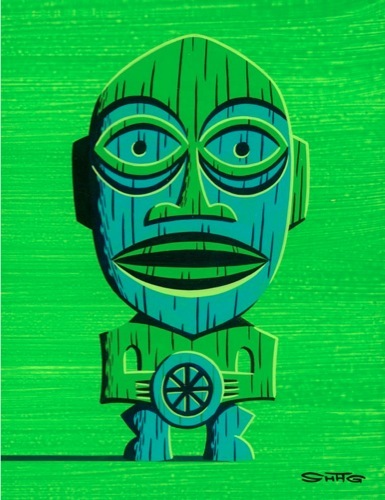 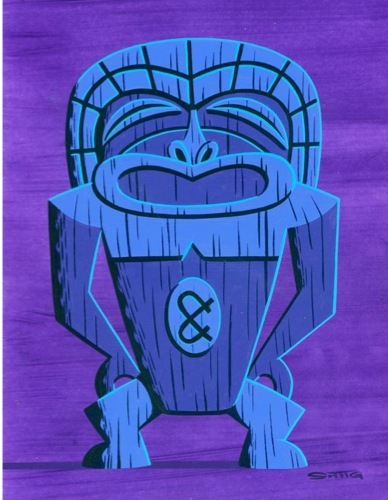 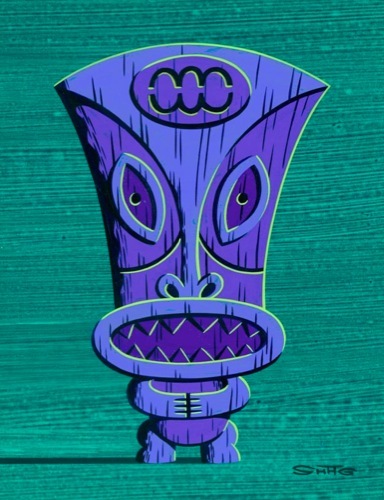 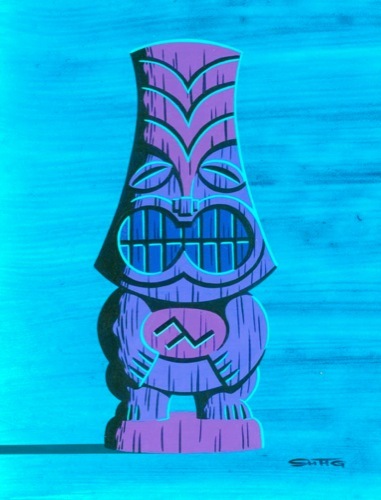 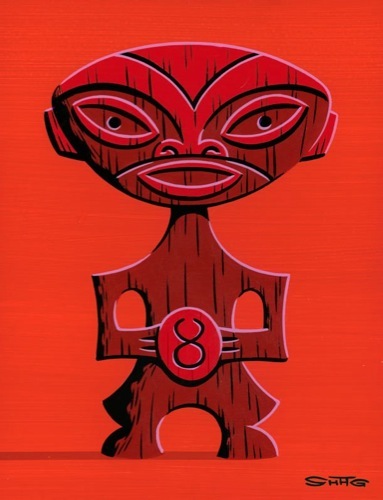 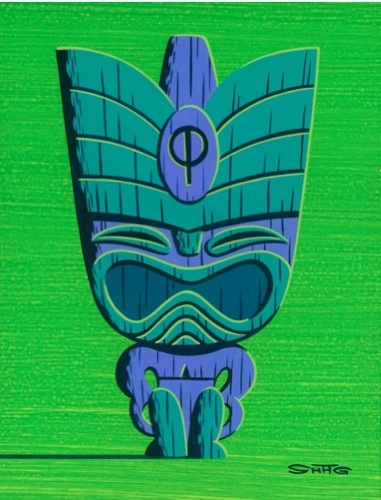 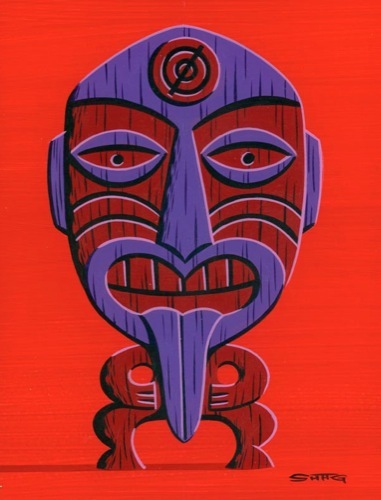 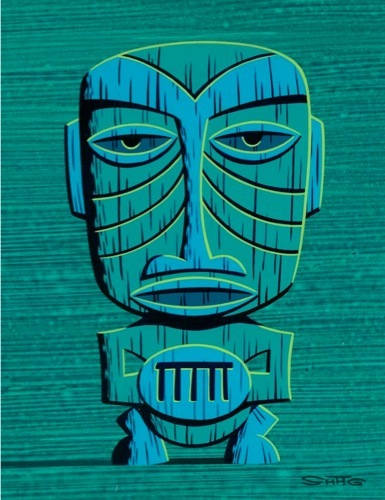 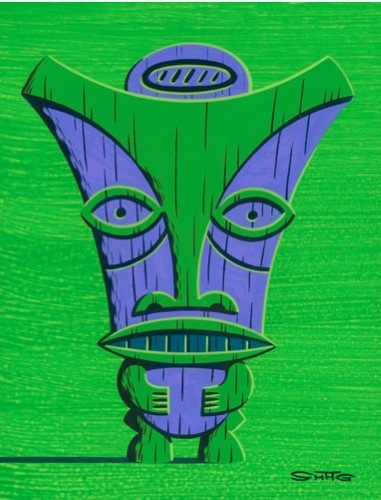 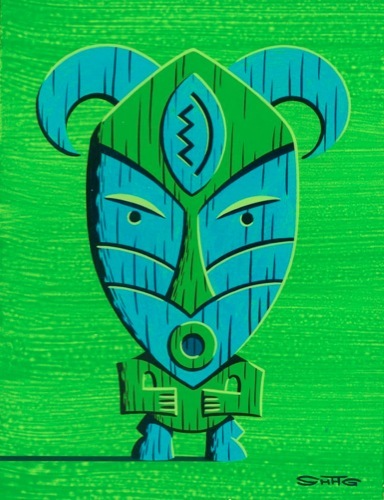 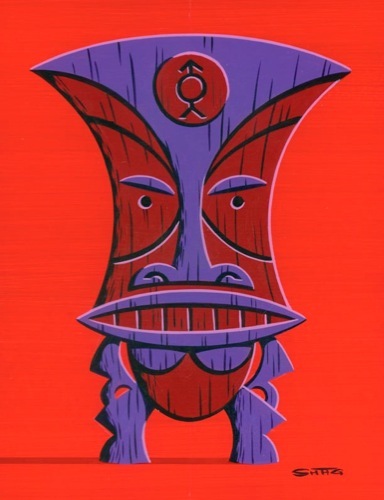 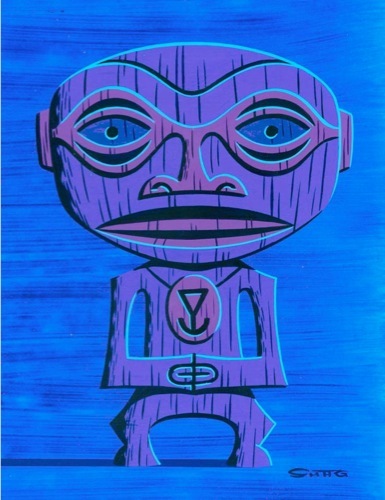 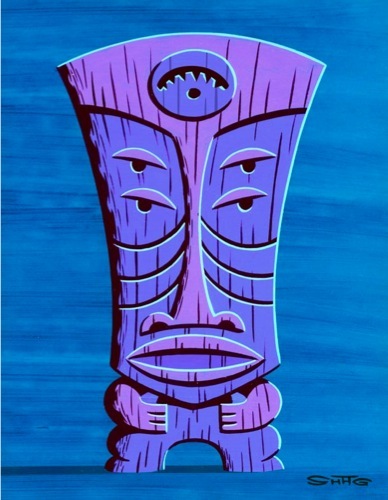 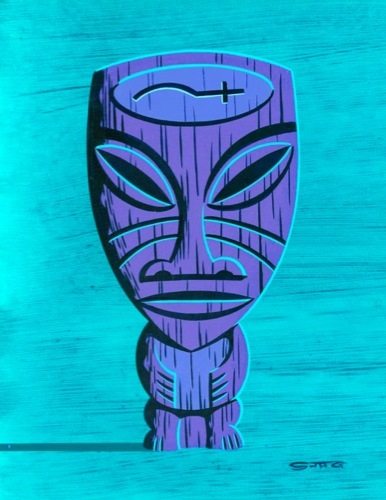 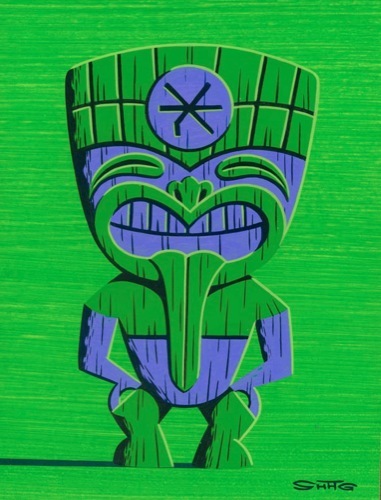 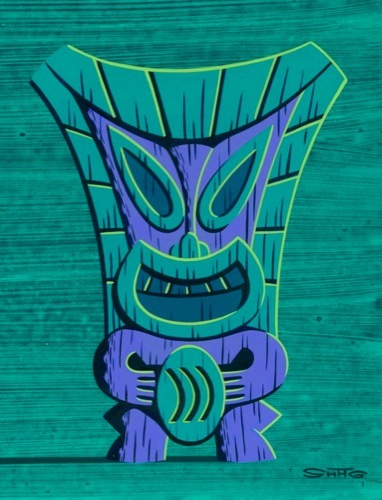 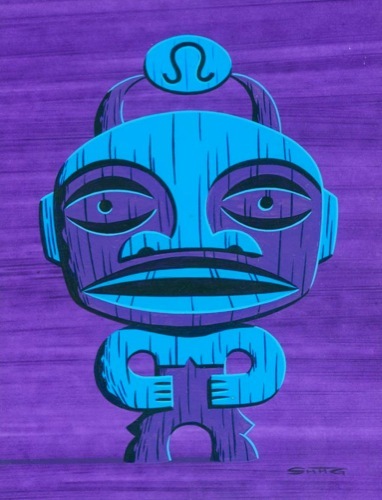 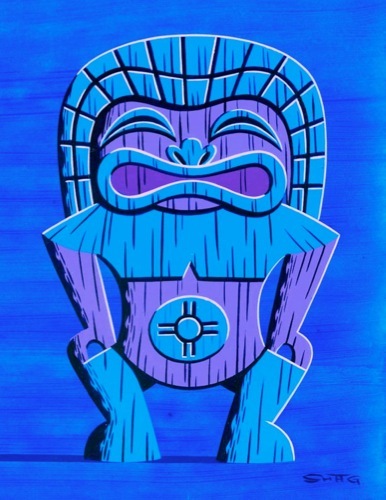 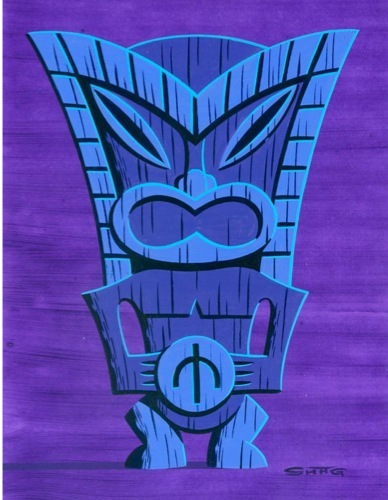 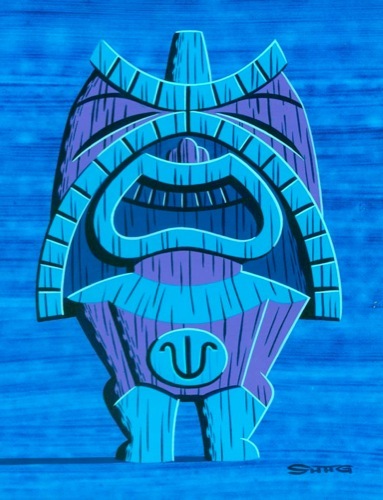 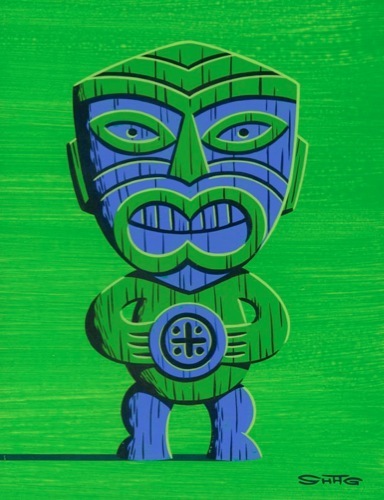 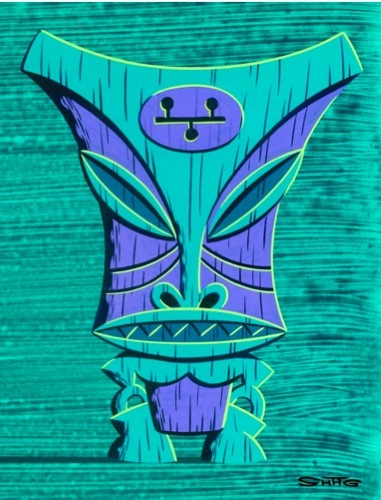 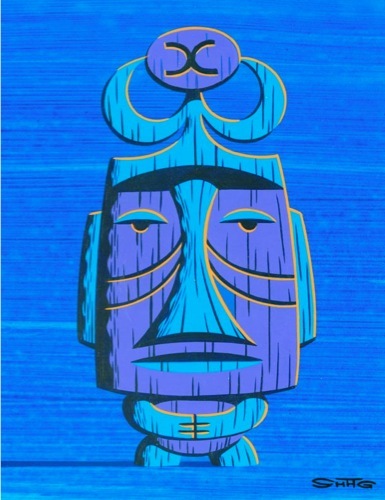 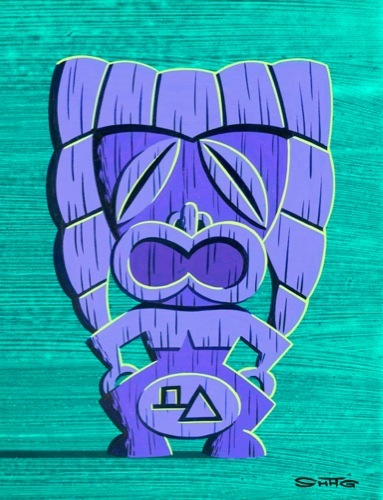 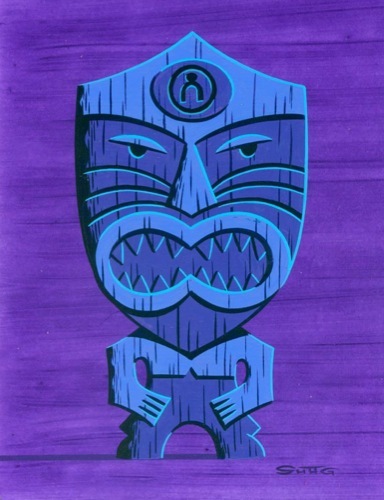 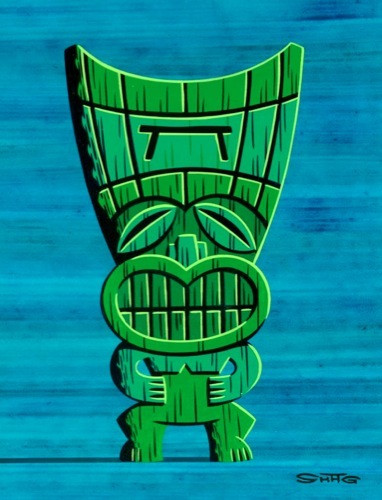 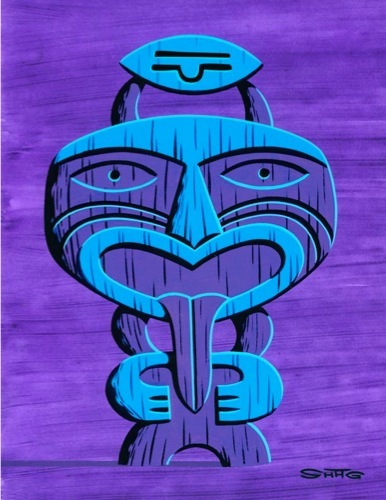 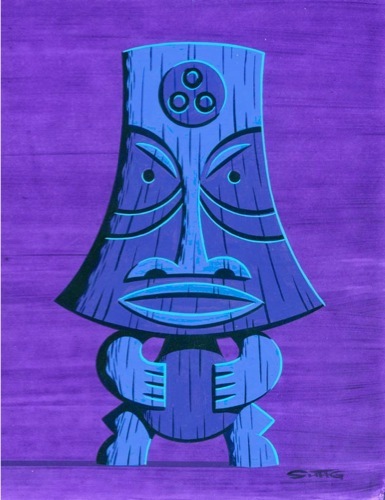 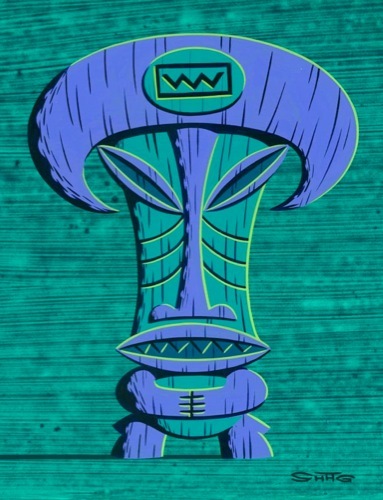 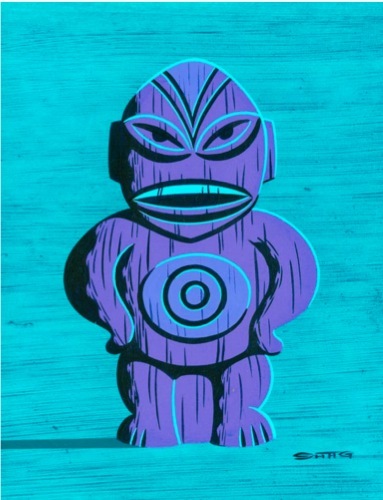 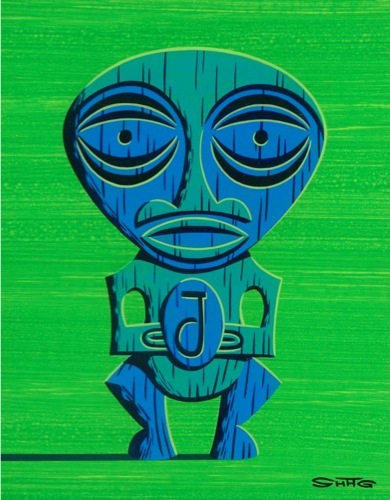 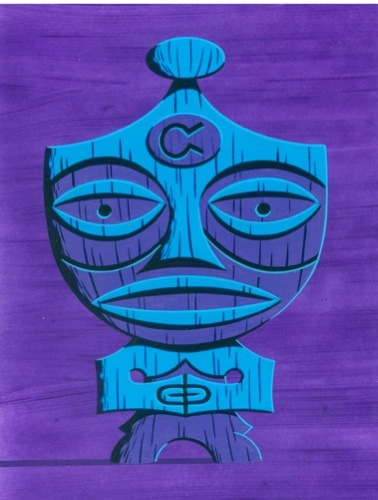 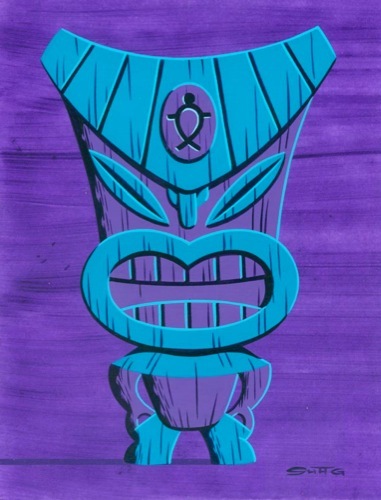 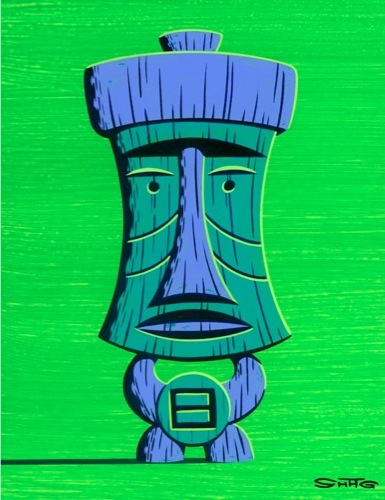 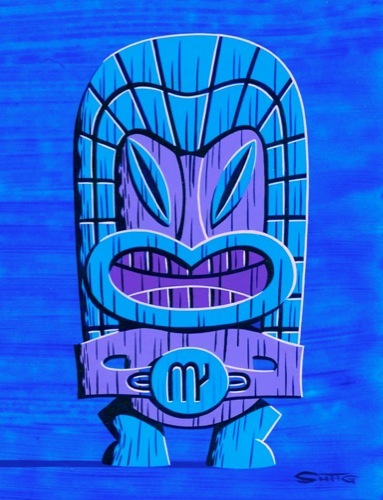 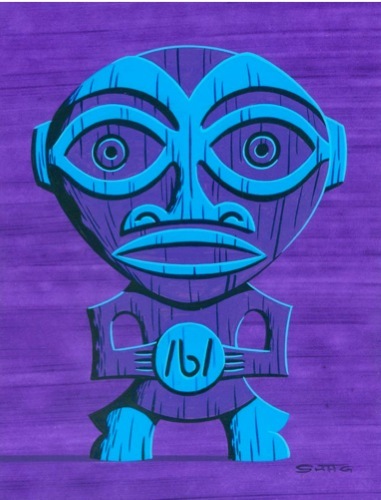 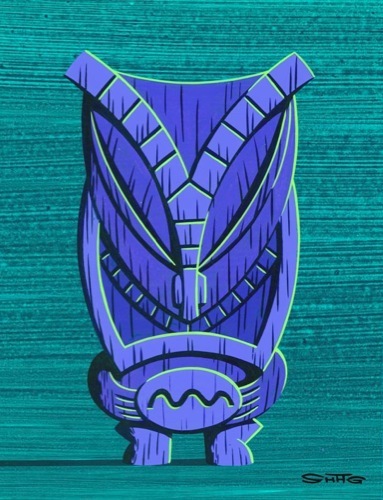 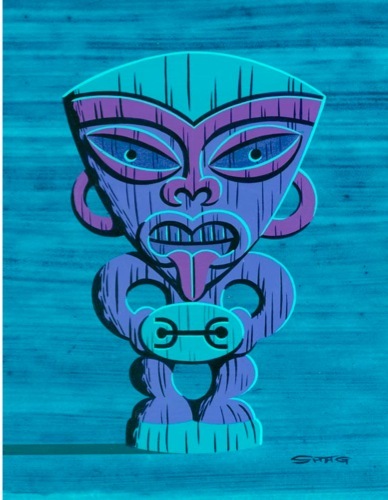 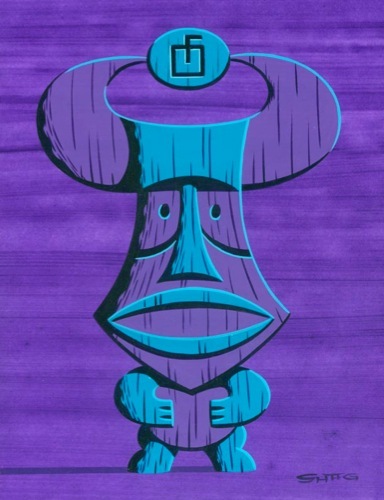 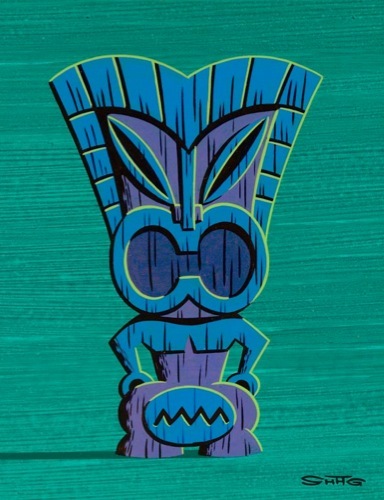 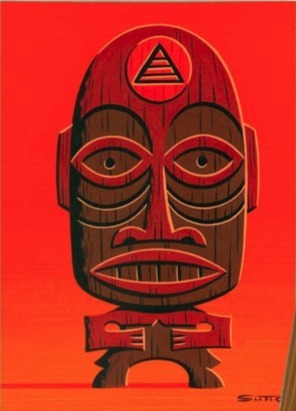 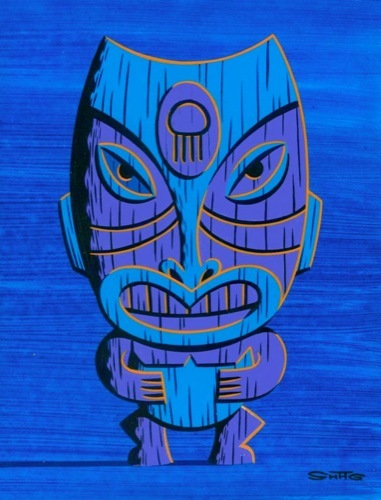 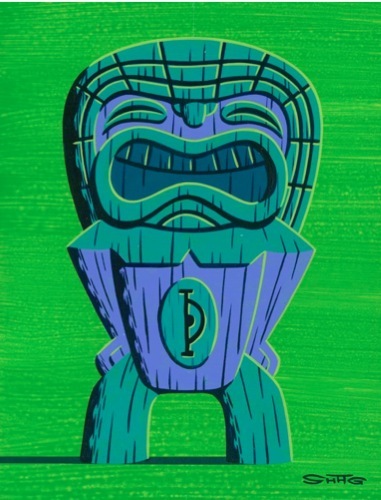 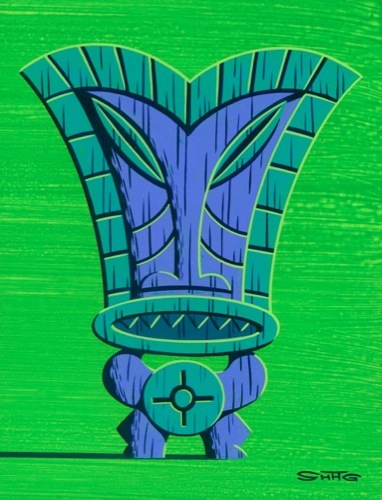 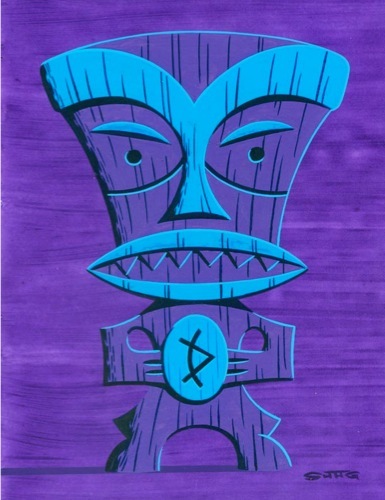 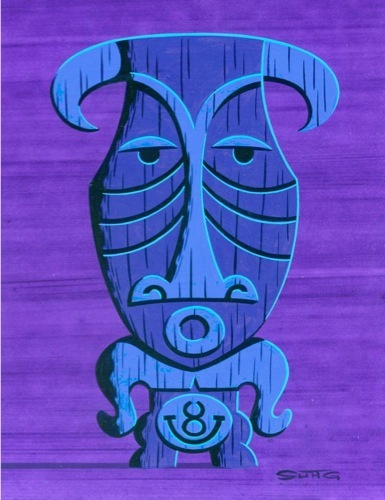 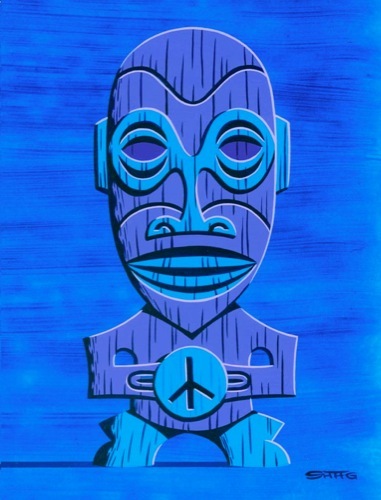 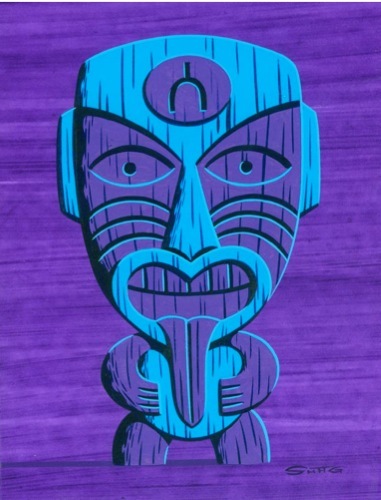 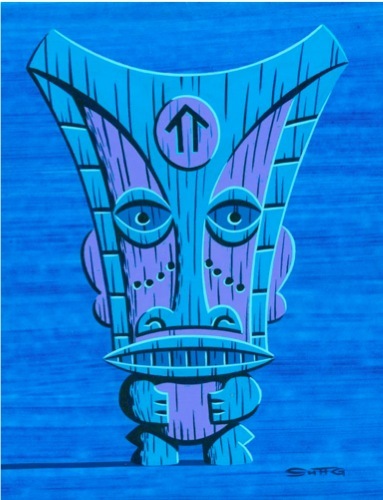 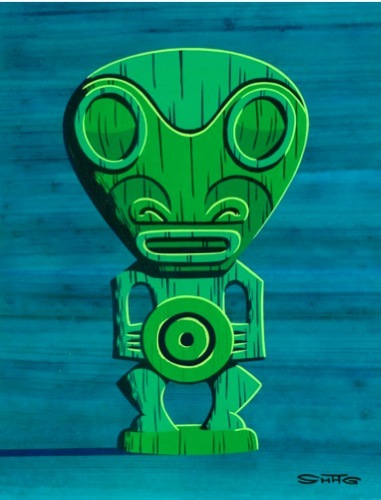 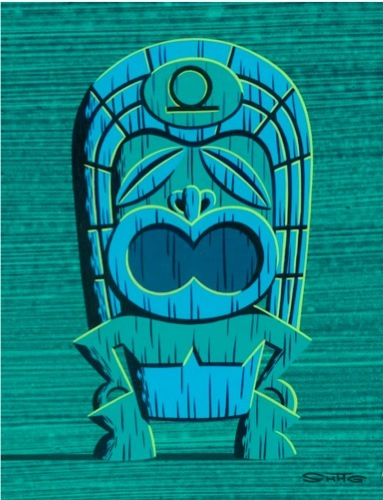 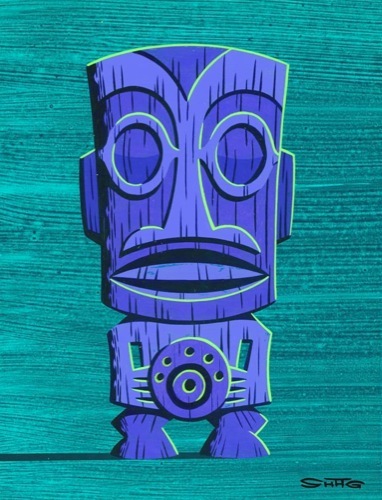 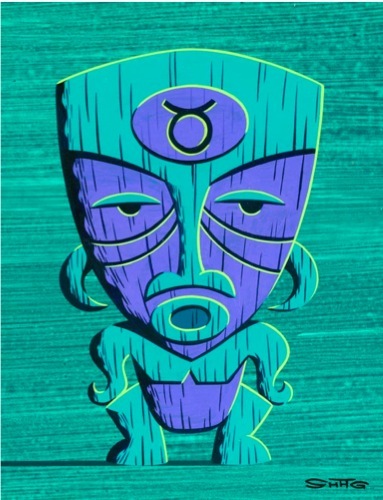 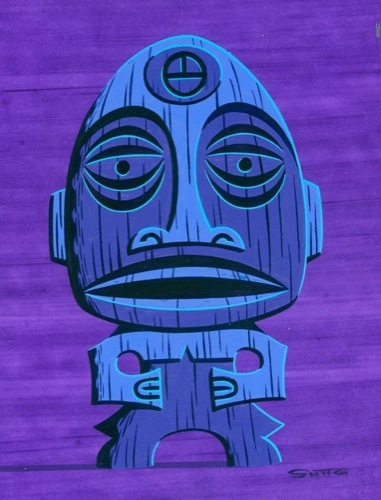 The exhibition included a series of ninety-nine small Tiki paintings of acrylic and vinyl on panels. 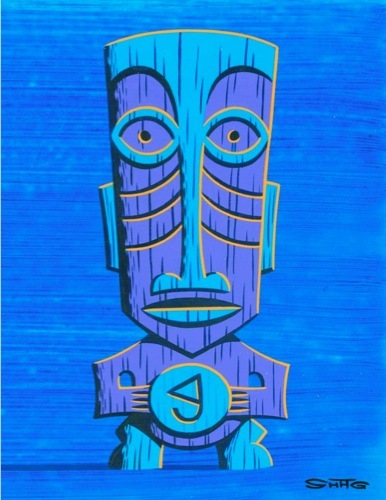 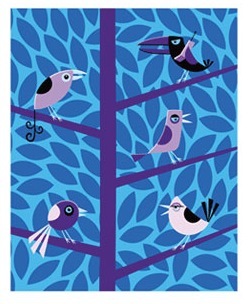 Each original image measures 7” by 9” (18cm x 23cm), costs $1700 USD ($2000 AUD) and is framed in linen and bamboo. 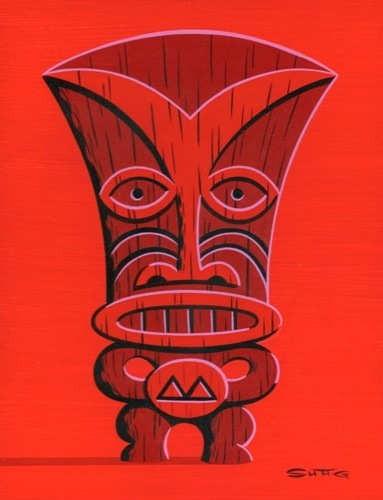 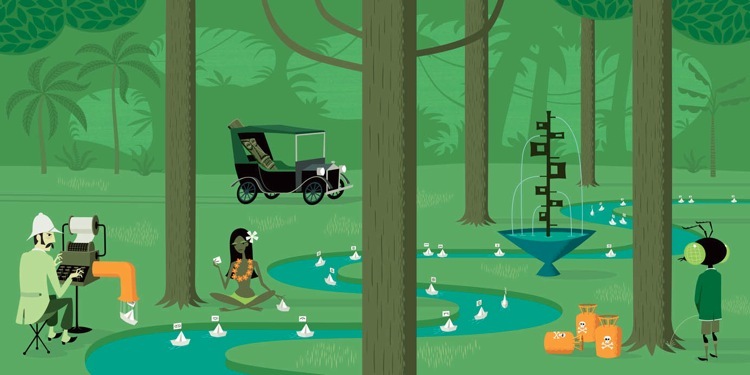 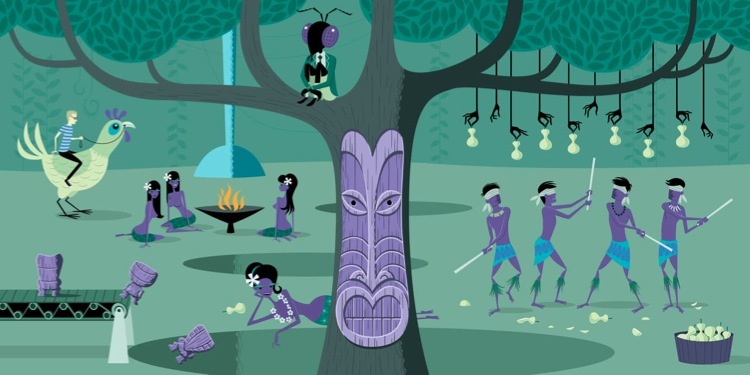 Each of the one hundred small Tiki paintings includes a symbol and has a short paragraph in the fifty-page Inscrutable Mystery Guide booklet with some insight or secret knowledge of that painting. 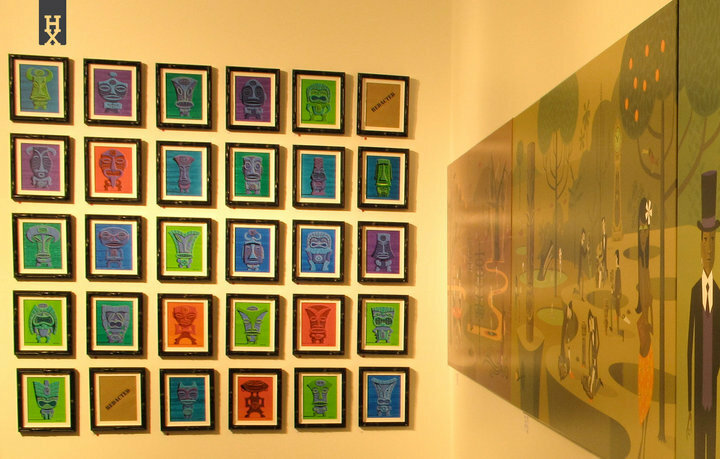 Only one hundred books were printed in a strictly controlled environment, each accompanying an original painting. 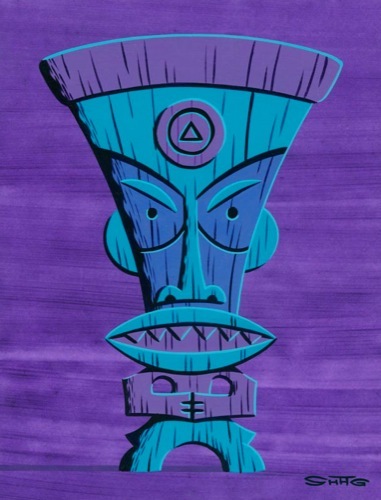 The booklet explains the symbology and reveals some of Shag’s secrets only to the purchasers of the paintings – in Shag’s words “I want to bring them into my own little cult and tell them some secrets”. 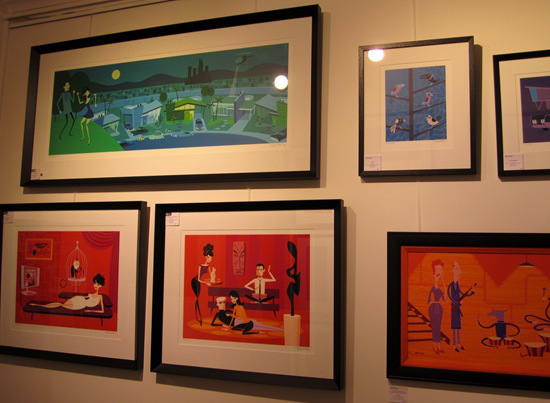 There were several limited edition serigraph prints shown at the Inscrutable Mystery Guide exhibition including artist proofs. 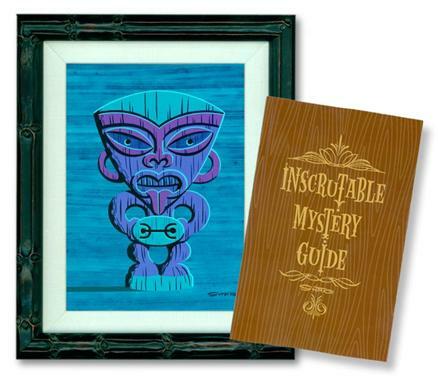 And to end, a few pictures from the Inscrutable Mystery Guide exhibition opening. 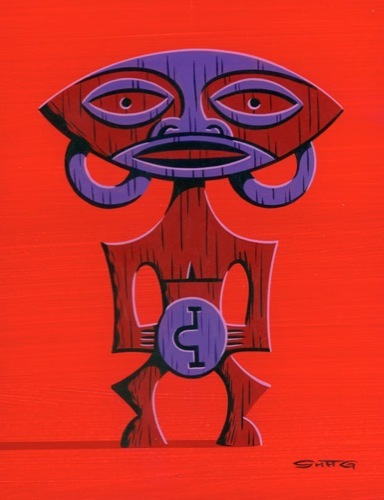 Note that many of the images in this post are sourced from the Outré Gallery website.